East LA missing person Elena De La Torre, was found safe and uninjured on Wednesday, February 21, 2018 at approximately 3:30 PM. She was taken to a local hospital to be evaluated, she is doing well and is reunited with her family. Los Angeles County Sheriff's Department Missing Persons unit would like to thank the public for their assistance in locating Ms. De La Torre. 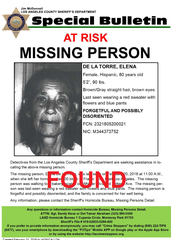 Detectives from the Los Angeles County Sheriff’s Department Missing Persons Unit are seeking the public’s assistance in locating Elena De La Torre, an 80 year old Hispanic female who was last seen on February 20, 2018 at 11:00 A.M., when she left her home on the 900 block of Fraser Avenue in East Los Angeles. Ms. De La Torre, was last seen walking to a bakery located on Whittier Blvd. and Fetterly Avenue. She is described as 5’2”, 90lbs, and has brown eyes and straight brown/gray hair. Ms. De La Torre was last seen wearing a red sweater with flowers and blue pants. Ms. De La Torre is forgetful and possibly disoriented. Her family is very concerned for her well-being and is seeking the public’s assistance in locating her.